Hope everyone had a wonderful 2012 and will have an awesome 2013! I know the big thing to do around this time of year is to make new year's resolutions but I never make any because it's just not my thing. Even if I made any resolutions I would probably forget about them anyway haha. 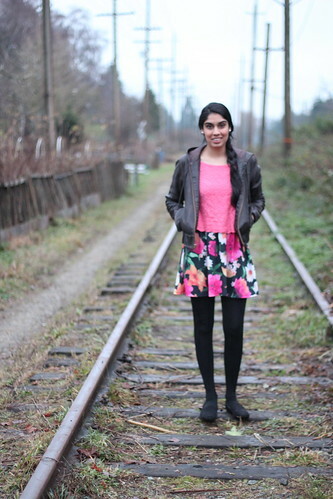 I decided to wear this outfit to bring a little cheer to the gloomy weather we Vancouverites get and add a little brightness to the winter season. It was still pretty warm because of the crop top I had on as well as the leather jacket and my tights were fleece-lined. PINK! My favorite :) That is such a lovely top! Ha yeah, I kind of gave up on resolutions this year - or maybe I'll just break them up into smaller goals so they're more manageable. Happy New Year to you and your sisters! Very cute dear :) happy 2013! you are very cute. happy new year ! Adorable outfit! 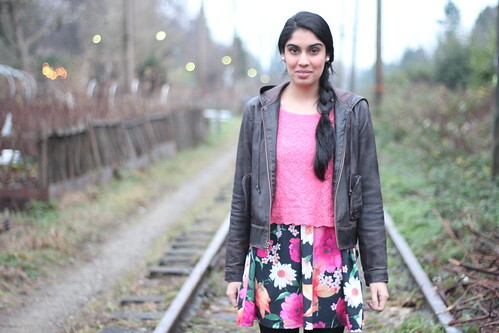 Loving the floral print, great for a bright winter look! This is SO pretty! I love that spring will soon be in the air. Also loving the jacket! I am really into floral prints right now! Something about bringing the spring to winter possibly? 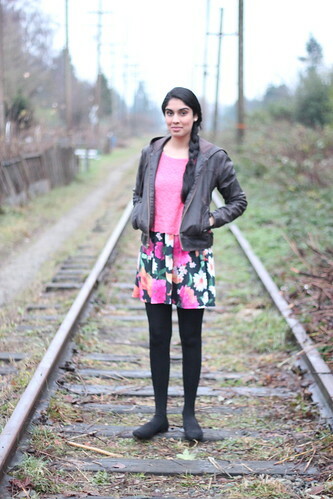 This look is adorable and I love the leather and floral combo! I love EVERYTHING about this look !! That is such a great skirt - love all the bright colors!!! You look so pretty and this outfit makes me ready for spring to come! Love your skirt and your jacket, so cute! The print of ur skirt is too vibrant n catchy !! I love bold prints like these ! Love the jacket with the outfit!